Big achievements have been recently reached in the political and economic spheres between Iran and Azerbaijan thanks to the political will of the Iranian and Azerbaijani presidents, Chief of the General Staff of the Armed Forces of the Islamic Republic of Iran, Major General Mohammad Bagheri, who is on a visit to Baku, said, Trend reports on Jan. 17. “Iran considers Azerbaijan a neighbouring, friendly and fraternal country,” he said. "However, the level of relations should be expanded." “The two countries are implementing joint projects, including the North-South Transport Corridor, the construction of the Rasht-Astara railway and other infrastructure and road transport projects,” Bagheri said. "The trade and economic ties between the two countries will be expanded thanks to these projects," he added. 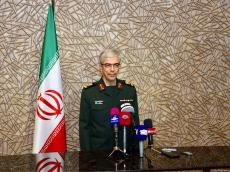 Bagheri stressed that the expansion of cooperation in the military sphere was discussed and certain agreements were reached during the fruitful meetings with Azerbaijani Defense Minister Zakir Hasanov and heads of other structures. He also touched upon the Convention on the Legal Status of the Caspian Sea, adding that its adoption by the five Caspian countries is a big advance. "The Convention will allow expanding cooperation and carrying out joint military exercises in the Caspian Sea," Bagheri said.